Organic Vegan Nutella! 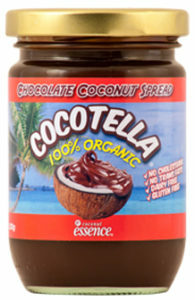 Lovely chocolatey spread. Ingredients: JT’s Coconut Essence Organic Coconut Oil (45%), Organic Coconut Blossom Sugar, Organic Cocoa, Organic Vanilla, Organic Starch, Water.